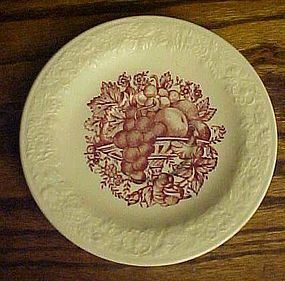 Homer Laughlin Harvest saucer, measures 6 5/8 in" with embossed rim and a red fruit compote transfer print design, made in 1948. Excellent condition with no chips cracks or crazing. Harvest was a breakfast set pattern produced jointly by Homer Laughlin, Taylor Smith and Taylor, and Royal China for Quaker Oats. This has the Homer Laughlin backstamp. I will be listing more of this pattern.